Gold Lake Lodge is a peaceful family resort in the mountains. Trails lead off directly from the lodge, and the nearest lake is a short ten minute walk. 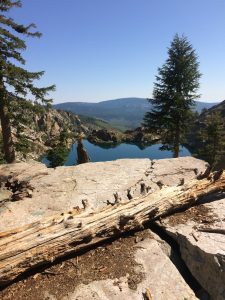 The ten lakes that make up the Lakes Basin are all in a roadless area, so you won’t be disturbed by a passing car. If you are interested in taking a drive, there are over a dozen other lakes that you can drive to as well. The lodge is fairly small, with just 12 cabins that we rent out. 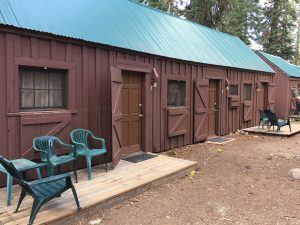 We have two two-bedroom cabins, seven one-bedroom cabins and three tent cabins to be used as an extra room, or rented alone. The one and two bedroom cabins each have a private bathroom and have at least a queen size bed. In the tent cabin you can have two single beds or one king-size bed, and you walk a short distance to the bathrooms. We provide all of the meals for you. Dinner and Breakfast are served to you in our Dining Room, and the fixings for a trail lunch are set out for you during breakfast. If you take a look at our rate sheet, the meals are included in the prices. All of the lakes are swimmable, and except for the smallest, they all have trout in them. For entertainment at the lodge, we have ping-pong and volleyball outside, as well as a Recreation Hall with lots of games, card tables and a comfortable sitting area. We usually have a campfire after dinner, and we provide the s’mores!